On Thursday March 9 one of our largest ebook platforms, ebrary, will be relaunched as Ebook Central. The content and features that you know from ebrary will be the same, but the search screens and the way search results are presented to you have been redesigned. One issue we want to alert you to before the relaunch concerns the Bookshelf feature on ebrary. 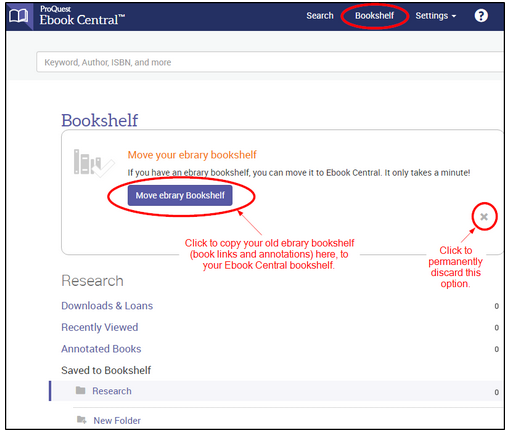 Ebook Central will have the same Bookshelf option but the contents of your own Bookshelf will not be automatically transferred from ebrary. However, it is very easy to do this, allowing you to keep any ebooks you have already saved, complete with any notes, highlights, and bookmarks you have used. Instructions for moving your Bookshelf from ebrary are outlined below. The option for transferring your Bookshelf is displayed when you sign into your Ebook Central account with your University of Aberdeen username and password, and click the Bookshelf tab near the top of the screen. Next select Move ebrary Bookshelf to begin the transfer. If you currently have no books in your ebrary Bookshelf there is nothing you need to do. If you click the X, the option to have your ebrary bookshelf copied over will not be displayed again. 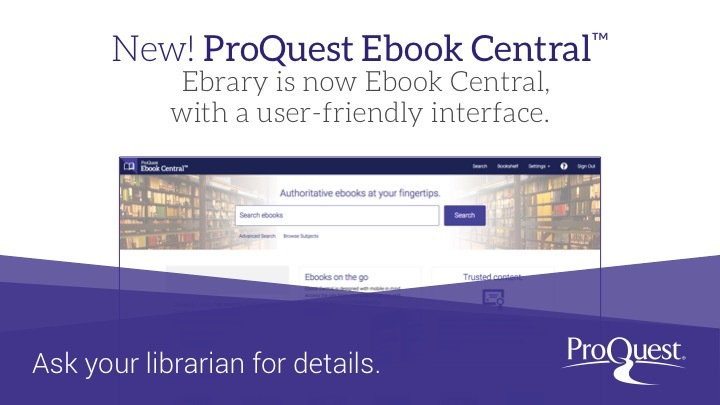 If you accidentally click the X and still want your ebrary bookshelf copied over, you will need to contact ebooksupport@proquest.com. After selecting Move ebrary Bookshelf you will then see the following screen. Click Get Started and follow any on-screen instructions. Once the transfer has been done successfully you will see the following message. You will not need to do this bookshelf transfer until Thursday March 9, but if you encounter any problems with the relocation of your bookshelf please contact ebooksupport@proquest.com. Further details and guides on Ebook Central will be available once the new platform goes live.